A common interview question is actually a statement: Tell us something about yourself. You obviously don’t want to answer that the same way you’d answer a blind date. You don’t want to say you’re hardworking and love people–just like everyone else. Where can you get some help identifying who you are in the workplace and the language for expressing yourself? Another useful source for a descriptions can be personality profiles. 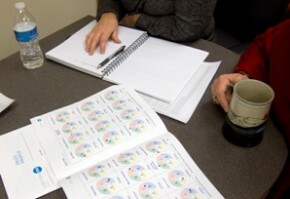 Many folks in HR understand when you tell them your MBTI, DiSC, or StrengthsFinder results. But don’t just say you’re a ESNJ, an S, and have Achiever, Input, and Woo in your top five strengths. Sometimes people begin to stereotype after working on a service level with these tools. Give specifics related to the workplace. Here’s how I could use my DiSC Workplace profile. It states “Since you’re most inclined toward the C style, you’re probably a bit on the systematic side, and you may enjoy creating standards that help bring about efficient, high-quality outcomes.” This is, indeed, true of me so I’d tell an interviewer that I enjoy creating standards and give an example of a worksheet I created and how well it worked. I have a concrete statement to make rather than a vague reference to being detailed-oriented. My DiSC Workplace report also states “You probably prefer to have a greater sense of control and stability in your environment.” I would use that information to craft a question for the interviewer about what changes are anticipated in the next year. Or to ask how might the job description change after six months. Perhaps your report would tell you that you speak freely, sometimes without concern for filtering your thoughts. So you could take that feedback to the interview and remind yourself to pause a bit before speaking about something you’re passionate about. Or maybe you’d rehearse how to speak about a previous manager with whom you had a conflict. People in sales know that they need to alter the message to the interests and personality of the buyer. Being able to get a quick read on your interviewer will help you, too. You might be able to tell that your interviewer is responsive to enthusiasm, or is looking for proof of accomplishments, or needs to move at a quicker pace than you prefer. You can review how you relate to other styles and prepare how you will respond to their needs. How have you used a personality profile to prepare for an interview or build your resume?